"Bring Back Bobby" harms no one. OK, let me get this straight. IU Basketball "fans" scream "f*** you" and "bulls***" at a game, embarrassing the university. In response, IU warns that a technical foul could be called on the home team for the obscene chants of the "fans" then proceeds to do absolutely nothing. Then, a fan wearing a shirt with the hand-written message "Bring Back Bobby" is threatened with arrest by an usher drunk on his own power. Are you kidding me? 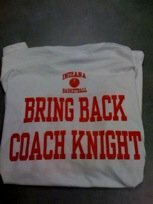 Whether IU Athletics wants to admit it or not, Bob Knight is an institution at Indiana University. The man coached the basketball team for three decades and brought several national championships to the school. His name was synonymous with IU basketball. He still has a loyal following among IU fans in Bloomington and IU alumni nationwide and will for a long time to come. Mike Davis was constantly compared to the man he replaced, and many fans are saying that had Knight been the coach, the recruiting scandal that led to the well-justified termination of disgraced ex-coach Kelvin Sampson would never have happened. But is seems the mere mention of his name sends some university officials into convulsions. Some are saying that this is a free speech issue. I do not believe this is the case. In order to attend an IU basketball game, you have to pay for a ticket. IU basketball has the right to control what the fans are saying, in writing or vocally. Virtually no one questions that IU has a right top put a stop to obscene chants or confiscate a shirt with an obscene message. IU can simply argue that buying a ticket is a contract that prohibits someone from behaving in a way that the University deems inappropriate. Whether the university has the legal right to censor the "Bring Back Bobby" shirt or not, it was a foolish and unecessarily authoritarian thing to do. Simply wearing a "Bring Back Bobby" shirt in no way harms anyone or disrupts the game, and Josh Tucker should have been left alone. All this childish act of censorship managed to do was bring further embarassment to a basketball program that needs as much positive press as it can get right now. It made the university look like it is run by petty, petulant children. Rick Greenspan should apologize to Tucker, face to face and in a very public way.